The Tech Director is responsible for overseeing Tech week, beginning the weekend prior to a performance (load-in) and lasting until the completion of load-out. Responsibilities include working with the rehearsal team and producer to create an effective schedule for Tech Week. This usually includes a paper tech for the lighting designer, sound designer, and stage manager to run their cues before involving the entire cast. Time generally must be included for load-in, light hang and focus, cue to cue, rehearsal, dress rehearsal, etc. It is the responsibility of the Tech Director to ensure that everyone involved knows the schedule and follows it. The TD is expected to attend all a-team meetings, production services meetings, dress rehearsals and performances. The TD is also responsible for organizing load-in and load-out. This includes assigning all guild members in attendance to specific tasks, and overseeing the loading in/out processes. The Tech Director should be comfortable working with the FAC crew. The Master Carpenter meets with the Set Designer, Scenic Artist, and Director to ensure that the design plans fit within the Theatre Guild’s capabilities. The Master Carpenter receives a budget from the Treasurer at the beginning of the process and works closely with her/him to make purchases within the budget. These purchases are made before the scene shop dates. The Master Carpenter overseas building in the scene shop, with safety taking precedence over all else. The Master Carpenter or a capable assistant must be present at scene shop at all times. They should delegate tasks to cast and crew members present when possible, teaching them the requisite skills to do so. Like any other guild endeavor, learning is a major focus of scene shop. The Master Carpenter coordinates the integration of the set pieces into the space and manages the construction of it, specifically during Load-In. Upon completion of this, the Master Carpenter stays through the remainder of tech week to ensure safety and the stability of the set. After the last performance the Master Carpenter orchestrates the disassembly and removal of the set from the space (Load-Out) by utilizing present cast, crew, and Guild members the Tech Director delegates to assist. The Shop Manager is in charge of maintaining a schedule for scene shop hours and helping Artistic Team and Cast members sign up for specific time slots. At the beginning of the semester, the Shop Manager will attend the 8-Week Meeting with Fine Arts Center staff and the Producer, Chair, Master Carpenter, and Set Designers, as this meeting determines when Guild shop hours will be during the semester. The Guild may only complete work in scene shop when a qualified Guild supervisor is available to watch and guide all Guild members working in shop. The Shop Manager will coordinate with all qualified supervisors–Master Carpenter, Carpentry Assistants, and Scenic Artists–to make a schedule assigning supervisors to the available hours set by the FAC at the 8-Week Meeting. When this schedule is finalized, the Shop Manager will post the hours and maintain a public sign-up list allowing all Guild members to volunteer for specific time slots. The Shop Manager will also be responsible for providing a shop sign-in sheet that Guild members must sign to confirm their work times in the shop. 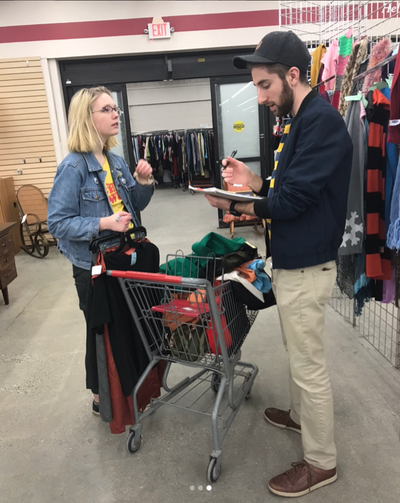 At the end of the semester, the Shop Manager will provide the sign-in sheet to the Secretary, who will tally Guild members’ hours to determine the status of their voting rights. The first thing the Set Designer needs to do is meet with the director and discuss the vision for the show. They then translate the director’s ideas into drawings/sketches. Providing the director with options is preferable. Upon receiving feedback (at various stages in the design process), the Set Designer finalizes the full design within the first two weeks of the rehearsal process. They must work with the master carpenter to ensure all aspects of the set are within the Theatre Guild’s capabilities and to discuss the means of constructing and painting it. The Set Designer also must meet with the Treasurer to confirm the plans can be carried out within the budget. The Set Designer should remain a resource during the process, willing and able to make adjustments as limitations arise over the course of the process. The Scenic Artist meets with the director and set designer. They then begin to take the director’s vision and set designer’s plans and translate them into the scenic design elements. These include the painting of set pieces, acquiring non-constructed pieces (namely furniture), and any other visual aspects of the set requiring the Scenic Artist’s skills. The Scenic Artist also must meet with the props master to decide which objects fall under the responsibility of each. The Scenic Artist also works closest with the set designer and master carpenter over the course of the project in order to create a satisfying artistic design in safe and educational environment. They receive a budget from the Treasurer at the beginning of the process and works closely with them to make purchases within said budget. Purchases must be made before the scheduled scene shop hours. During scene shop, the Scenic Artist uses the time and resources (after discussion with the master carpenter) to paint the set and tend to any other scenic matters. They should delegate as many tasks as possible to the cast and crew present, demonstrating and guiding them through the necessary activities. The Scenic Artist must be present for the duration of tech week in order to handle any scenic problems arising during the technical run-throughs. 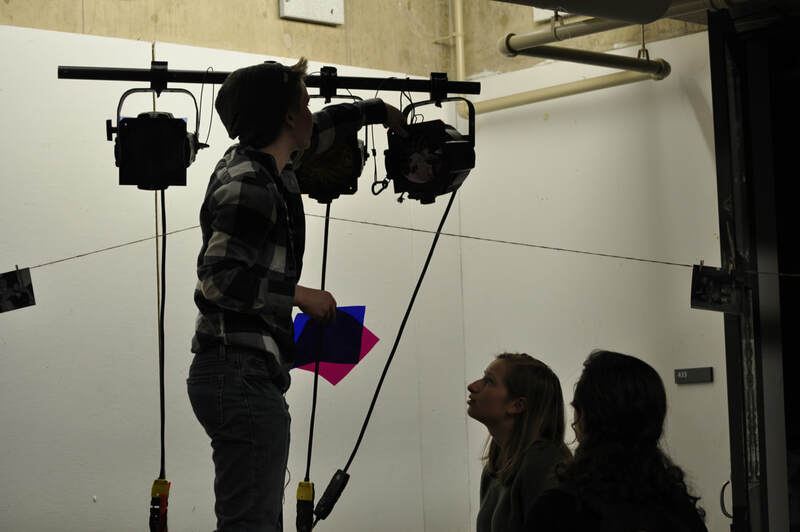 The Lighting Designer collaborates with the Director and the other visual designers to establish the setting, mood, and atmosphere of the play. The Lighting Designer should be comfortable with all equipment related to lighting (the lights, board, booms, gels, etc.) and is responsible for the equipment during tech week and the shows. The Lighting Designer should maintain communication with the Director and Set Designer to plan out their design ideas to be consistent with the vision and complement the set pieces. The Lighting Designer must attend artistic team meetings and attend some rehearsals prior to tech week. At the beginning of tech week, the LD orchestrates the hanging and focusing of lights and should be comfortable utilizing a Fine Arts Center crew of up to seven people. The Lighting Designer also runs the cue-to-cue with the Stage Manager, and works with the SM to establish cue placement. The Lighting Designer position requires a strong understanding of lighting concepts, such as warm/cool washes, side lighting, ground lighting, specials, gobos, etc. The LD receives a budget from the Treasurer at the beginning of the process and works closely with her/him to make necessary purchases within the budget. The LD needs to be comfortable finding any items to be purchased from outside companies if need be. For alternate space shows, lighting capabilities will vary dependent upon the limitations and resources with in the space. The Lighting Designer will need to be able to adapt and be willing to operate with alternative forms of lighting (such as trees) in the event that the show takes place in a non-theater space. Questions regarding the space may be directed to the executive board. The Sound Designer meets with the director at the beginning of the process to learn the vision, and then begins to compile and/or create the sound clips, underscoring, or soundscape(s) for the show. Depending on the type of show, microphones may be required. The Sound Designer is also charged with acquiring the microphones and should have the requisite skills and knowledge to set up and operate them along with the soundboard. For any such purchases or rentals, the Sound Designer will work with the Treasurer to stay within a budget set by the Treasurer. The Sound Designer is expected to be present for the entirety of tech week. They need to organize the loading in and setting up of sound equipment. Over the course of the week, the Sound Designer is in charge of the sound of cues, working with the Stage Manager and director (if necessary), to figure out cue placement and make adjustment to cues as needed. The Sound Designer also should be prepared to help mitigate/organize microphone changes if body microphones need to be passed from one actor to another during the show. The Sound Designer also must be comfortable running a mic check and setting levels before a show, as well as adjusting microphone levels during a run through or performance. The Props Master is in charge of acquiring and organizing all of the props used in the show. The Props Master needs to meet with the Director early in the process to discuss the vision and ensure the props are consistent with it. They also must create a list of props by reading through the script and consulting with the Director and Stage Management about what is necessary. Props or stand-in props should be integrated at rehearsals as early as possible. They receive a budget from the Treasurer at the beginning of the process and works closely with her/him to make purchases within said budget. Purchases must be made before tech week. The Props Master must also communicate with the Set/Scenic team to be clear on whose responsibility it is to take care of all objects on stage. The Props Master creates an organized prop table and manages it during the run-throughs and shows. 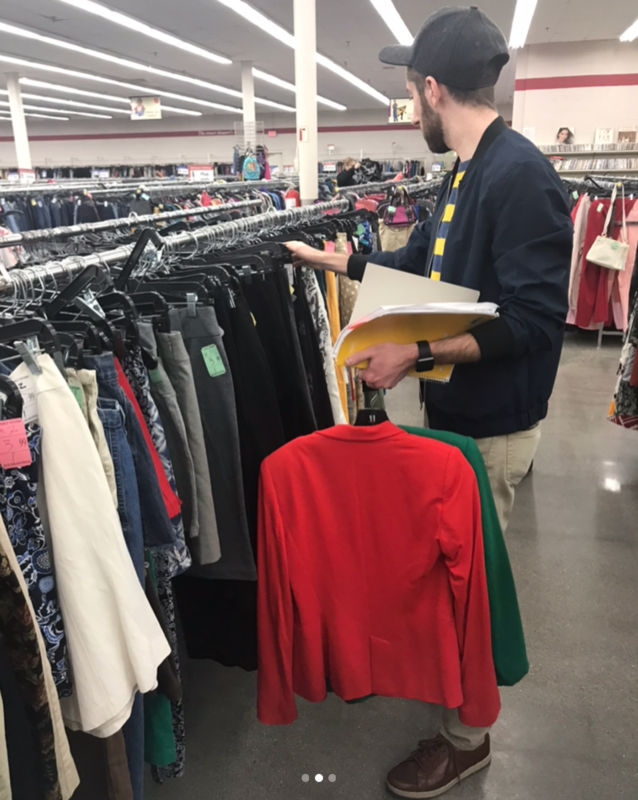 After meeting with the director to discuss the vision of the show, the Costume Designer develops the concepts for the costumes of each character. S/he maintains a dialogue with the director throughout the process. The Costume Designer then takes measurements of the actors and purchases/finds/makes the costume pieces needed for the show. They receive a budget from the Treasurer at the beginning of the process and works closely with her/him to make purchases within said budget. 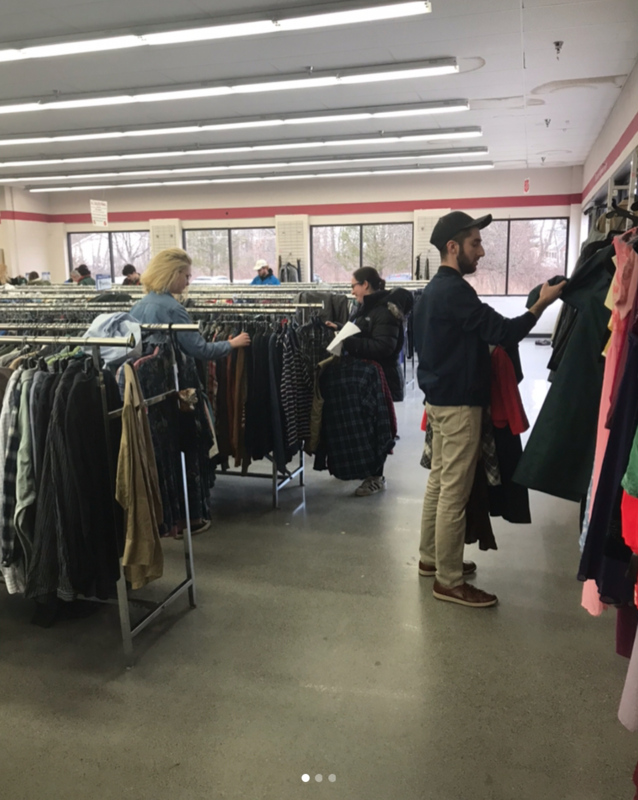 The Costume Designer may request actors bring in articles from their own wardrobe, though this must be asked in a timely fashion to account for the difficulty of some to go home or send for clothing from home. The Costume Designer should have all costume pieces before tech week. The Costume Designer needs to be present during all of tech week in order to handle any problems arising. They also need to help backstage with quick changes if necessary during run-throughs and performances. The Hair / Make-up Designer meets with the director early in the process to discuss the Director’s vision and begin to think of the hair / make-up requirements for each character. They receive a budget from the Treasurer at the beginning of the process and works closely with her/him to make purchases within said budget. All hair / make-up implements must be purchased before tech week. The Hair / Make-up Designer should inform the cast as soon as possible of cosmetics needed and what they may/may not do with their hair in the weeks leading up to the show. During tech week, the Hair / Make-up Designer explains to the cast the make-up application (diagrams that can be posted in dressing rooms are very helpful). They help with the hair / make-up of cast members requiring particular attention before dress rehearsals and shows. The Hair / Make-up Designer also helps with any make-up changes backstage if necessary (for example, the aging of a character over the course of the play). During tech week, the Hair / Make-up Designer should be watching run-throughs of the show (unless they are doing changes backstage) in order to make adjustments upon seeing the Hair / Make-up in stage lighting and with costumes.